Why should ninth grade students come study with us? Because our goal at the Anières Elite Academy is to guide youth to the highest achievements in science and technology and even beyond that, we think it is important to pave a way for life experiences, multicultural relationships, and plenty of enriching activities. All of this is vital so that young people receive the essential tools both for studies and for life. 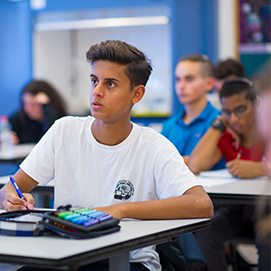 Enrichment studies at the Technion during high school, including orientation tours in the different faculties. Assistance and reinforcement in scientific-technological subjects. A unique track for outstanding students to accumulate academic credits. A preparatory course for the psychometric exam. Preparation for academic engineering studies and participation in the Technion’s open day and the IDF’s Academic Atuda (Reserve) conference. Scholarship for financing a designated high school track until the completion of a bachelor’s degree (Engineer – B.Sc.) at the Technion, in accordance with admission criteria compliance. Excellent living conditions in a spectacular youth village surrounded by open green spaces. A wide variety of activities – horseback riding, carpentry, chess, kennels, table tennis, music and dance, theater, film acting, and combat fitness training. State-of-the-art sports facilities – the youth village has a semi-Olympic swimming pool which is open all year round, as well as a gym, sports hall, basketball courts and soccer fields. A comprehensive social-values ​​program that includes seminars, tours, workshops, Gadna (a one-week introduction to the IDF service), and community service. A wide range of cultural activities – music and dance performances, theater performances, and lectures. Personal guidance is provided to each and every student by a top educational team to ensure optimal integration on personal, social and study levels. Pocket money and travel fees throughout high school. We would be happy to welcome you to the Anières family.